Deep learning is a form of machine learning which allows a computer to learn from experience and understand things from a hierarchy of concepts where each concept being defined from a simpler one. This approach avoids the need for humans to specify all the knowledge that the computer needs. The hierarchy of concepts allows the computer to learn complicated concepts by building them on top of each other through a deep setup with many layers. The first thing you need to learn when it comes to learning deep learning is the applied math which is the fundamental building block of deep learning. Linear algebra is a branch of mathematics that is widely used throughout engineering. However since it is not a form of discrete mathematics a lot of computer scientists don’t have much experience with it. A good understanding of linear algebra is essential for understanding and working with many machine learning algorithms, especially those involved with deep learning. Scalars, Vectors, Matrices, Tensors, Multiplying Matrices and Vectors, Identity and Inverse Matrices, Linear Dependence and Span, Norms, Special Matrices and Vectors, Eigendecomposition, Singular Value Decomposition, The Moore-Penrose Pseudo-inverse, The Trace Operator, and the Determinant. The first is that it tells us how our AI systems should reason. The second is that we can use probability and statistics to analyze the behavior of proposed AI systems. Random Variables, Probability Distributions, Marginal Probability, Conditional Probability, Chain Rule of Conditional Probabilities, Independence and Conditional Independence, Expectation, Variance and Covariance, Common Probability Distributions, Useful properties of common functions, Bayes’ Rule, Continuous Variables, Information Theory, Probabilistic Models. Machine Learning Algorithms almost always require a high amount of numerical computation. This is typically referring to the iterative processes that the ML algorithms will use to solve mathematical problems. Common operations include Optimization (finding a value that minimizes or maximizes some function) as well as solving linear models and systems of equations. Deep learning is really just and special kind of machine learning. To understand deep learning one must have a solid understanding of machine learning. You will need to know things such as what a learning algorithm is such as the linear regression algorithm, how to fit the data appropriately for that algorithm, finding patterns in that data, and hyperparameter tuning. Machine learning in the end is just very complex applied statistics and it uses computers because they can more easily estimate complicated functions. Deep learning provides a powerful framework for supervised learning. By creating a neural network and adding more layers and more units within each layer you are given the ability to represent functions of increasingly high complexity. Deep feedforward networks, also called feedforward neural networks, or multilayer perceptrons, are the quintessential deep learning models. The goal of one of these feedforward networks is to approximate some function f.
A common problem in machine learning is how to create an algorithm that will perform well not just on the training data, but also on new inputs. Many strategies in ML are designed to reduce test error usually at the expense of increased training error. These strategies are known as regularization. One of the many goals of deep learning is to develop more effective regularization strategies. Parameter norm penalties, Norm penalties as constrained optimization, Regularization and Under Constrained problems, Dataset Augmentation, Noise Robustness, Semi-Supervised Learning, Multitask Learning, Early Stopping, Parameter Tying and Parameter Sharing, Sparse Representations, Bagging and other Ensemble Methods, Dropout, Adversarial Training, Tangent Distance, Tangent Prop, and Manifold Tangent Classifier. Deep learning models involve optimization in many ways. For example inference in models such as Principal Component Analysis involves solving an optimization problem. The most difficult optimization problem in deep learning is that of neural network training. 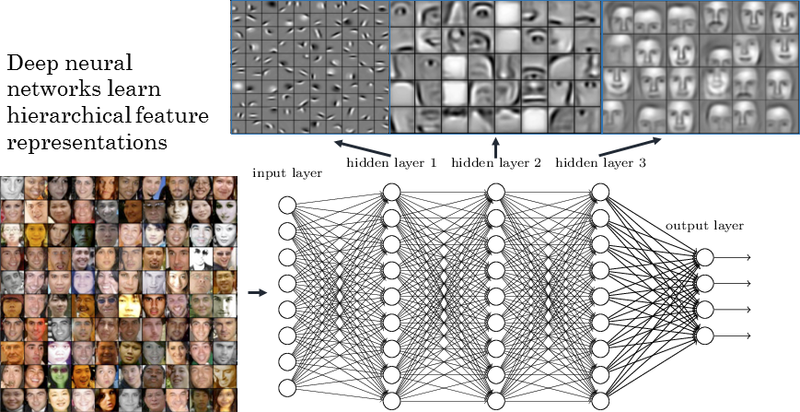 Convolutional neural networks are a specialized kind of neural network for processing data that has a known grid-like topology. Examples of this are time-series data which can be though of as a 1-D grid taking samples at regular time intervals and we also have images which can be thought of as a 2-D grid of pixels. Convolution is a specialized kind of linear operation. Recurrent neural networks are a family of neural networks for processing sequential data. These are very similar to CNNs in the fact that it is specialized for processing a grid of values however they use a system to process a sequence of values and generalize across them. Successfully applying deep learning techniques requires more than just a good knowledge of what algorithms exist and the principals that explain how they work. During day to day development of machine learning systems, practitioners need to understand whether or not to gather more data, increase or decrease model complexity, add or remove features, improve the optimization of a model, improve approximate inference in a model, or debug the implementation of the model, and more. All of these are very time consuming and therefore it is important to be able to determine the right course of action. Deep learning can be used to solve applications in computer vision, speech recognition, natural language processing, and other areas. Some degree of specialization is required in each of these tasks when it comes to designing the algorithms. This section will just list the topics that are the more ambitious and more advanced approaches to deep learning.